Coveo is a unified site search and indexing software for business services, financial, healthcare, energy & utilities, high tech, media, manufacturing, telecommunications, and retail industries. It is an AI-powered platform that consolidates information repositories securely across numerous social, enterprise and cloud-based systems. The solution ensures that all employees as well as corporate clients and partners can access applicable data with context at each interaction, thereby helping organizations to provide custom-made experience at scale. Coveo is a powerful information consolidation system that delivers fast, secure, and global access to regulated and unregulated information in numerous systems throughout the organization. The platform leverages intelligent, predictive site search technologies with integrated plugins for optimal results. Some of its main features include admin experience, AI/machine learning, complex search/filtering, text analytics, query engine, security & compliance, and usage analytics. Coveo is an innovative site search solution that enables today’s fastest growing organizations to keep their edge. It empowers support agents, employees, customers, website visitors, and partners with the right tools to always get accurate information anytime, anywhere thanks to its cloud-based and on-premise deployments. The platform is uniquely designed to intelligently deliver knowledge and crucial comprehensions from across the whole IT ecosystem at scale. At the backend, Coveo archives a unified index of the unceasing data masses available within your business, thereby making it easy to find the most relevant information. On the other hand, its front end provides numerous out-of-the-box access points within a unified search box for one keystroke or one-click operations. This helps you not only to search content with ease but also reveal unique perspectives to run the business more effectively. The solution also facilitates constant up-to-date indexing of organization knowledge and provides search-powered dashboards and custom composite information mash-ups for expedient searches. Additionally, Coveo has one of the strongest strategic partnership with leading system integrators and technology vendors. For instance, its seamless integration with Sitecore and Salesforce makes it easy for mutual customers to achieve optimal value. Sitecore (a reliable Customer Experience Platform) permits unified indexing for numerous repositories, usage analytics, search management, and machine learning-powered search through the Sitecore console. The extension works in unison with Salesforce CRM to ensure users unravel the full potential of the process, people, and technology. 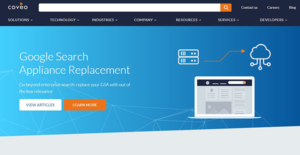 If you are interested in Coveo it might also be a good idea to investigate other subcategories of Best Site Search Solutions listed in our base of B2B software reviews. Since each organization has particular business requirements, it is sensible for them to refrain from seeking a one-size-fits-all perfect software application. Needless to say, it would be pointless to try to find such a system even among popular software applications. The clever thing to do would be to catalog the various important elements that require consideration such as required features, budget, skill levels of employees, company size etc. Then, you should do your research thoroughly. Read some Coveo reviews and check out each of the other apps in your shortlist in detail. Such comprehensive homework can make sure you reject ill-fitting platforms and zero in on the solution that presents all the features you need for business success. How Much Does Coveo Cost? Coveo doesn’t publish its enterprise pricing; contact the vendor for in-depth pricing details. We realize that when you make a decision to buy Site Search Solutions it’s important not only to see how experts evaluate it in their reviews, but also to find out if the real people and companies that buy it are actually satisfied with the product. That’s why we’ve created our behavior-based Customer Satisfaction Algorithm™ that gathers customer reviews, comments and Coveo reviews across a wide range of social media sites. The data is then presented in an easy to digest form showing how many people had positive and negative experience with Coveo. With that information at hand you should be equipped to make an informed buying decision that you won’t regret. What are Coveo pricing details? What integrations are available for Coveo? If you need more information about Coveo or you simply have a question let us know what you need and we’ll forward your request directly to the vendor.